At the first board meeting of the new Society, Alo Duffy, Ballybay, Co Monaghan was appointed Chairman of the Co-operative together with two Vice-Chairs, Colin Kelso from Omagh, Co Tyrone and Alan McCay from Dunamanagh, Co Tyrone. Alo Duffy, Chairman of Lakeland Dairies said: “This is a historic and progressive development. 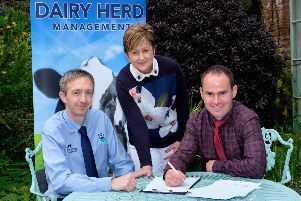 The fruits of the merger will be realised as we continue to grow and develop our co-operative for the long-term benefit, sustainability and livelihood of dairy farmers. “I welcome all members and milk producers collectively into our new co-operative society. Our mutual progress will be underpinned by the confidence that comes from working together to create a strong and secure future for our dairy farming families and our generations to come. “Both of the societies now forming Lakeland Dairies have a proud heritage of excellence in dairy farming. From today, we combine our mutually valued heritage into one. There is no looking back, only a collective movement driving forwards to achieve commonly held goals.